Self-adhesive Linerless Tags for Baggage at Airports. Passengers love the fact that they can't make a mistake tagging their bag. Bengaluru Airport launches fully automated self bag facility. 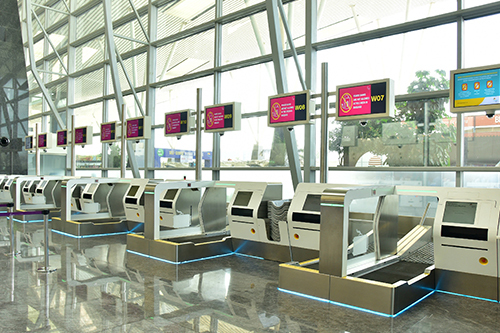 In a span of just 45 seconds you can complete your baggage check-in at the Kempegowda International Airport (KIA) as Self Bag Drop system has been launched..
Gatwick tested several self-tagging possibilities and drew the conclusion that eezeetags has the performance. The solution for a clean experience wasn't realized until we started to use eezeetags snap-tag. The trial is already speeding up the process for passengers and the initial feedback has been very positive. After opening AutoBagdrop at Dublin Airport the bagdrop capacity grew with 200%, operational costs dropped and the passenger satisfaction tripled. The future of self-tagging is (almost) there. Drop a quick message in our inbox and we'll find an answer for you.